This article is about the children's entertainer. For the Armenian novelist, see Raffi (novelist). For other uses, see Raffi (disambiguation). Raffi Cavoukian, CM OBC (Armenian: Րաֆֆի, born July 8, 1948), known by the mononym Raffi, is a Canadian singer-lyricist and author of Armenian descent born in Egypt, best known for his children's music. He developed his career as a "global troubadour" to become a music producer, author, entrepreneur, and founder of the Centre for Child Honouring, a vision for global restoration. Born in Cairo, Egypt, to Armenian parents, he spent his early years in Egypt before emigrating with his family to Canada in 1958, eventually settling in Toronto, Ontario. His mother named him after the Armenian poet Raffi. His father Arto Cavoukian was a well-known portrait photographer with a studio on Bloor Street in Toronto. His older brother Onnig Cavoukian, known as Cavouk, is also a famous portrait photographer. His younger sister is Ann Cavoukian, Ontario's former Information and Privacy Commissioner. His parents died within twelve hours of each other, his mother dying first, of abdominal cancer. In the early 1970s, Raffi frequented a guitar store near Yonge and Wellesley called Millwheel, where he met other developing Canadian musicians such as David Wilcox and John Lacey. Raffi ran a coffee house at the University of Toronto up until 1980. He befriended Lacey, a folk guitarist from Oakville, Ontario, who helped Raffi improve his finger picking (John went on to become a steel guitar player). Raffi continued playing folk guitar in various coffee houses in Toronto and Montréal before hitchhiking to Vancouver in 1972 to find "fame and fortune." He returned to Toronto after a few years and was invited to sing for a Toronto public school. Despite his own hesitations about singing for kids, he was an immediate success, and thus he began his career entertaining children. After a seven-year gap in publishing, Raffi released an album, Let's Play, in 2002. He moved to Saltspring Island near Victoria, British Columbia, in 2008. Raffi is a member of the Canadian charity Artists Against Racism. Once called "the most popular children's singer in the English-speaking world", he is well loved by many children born in the 1970s, 1980s and 1990s for his popular children's songs. His autobiography, The Life of a Children's Troubadour, documents the first part of his award-winning career. Some of Raffi's best-known children's songs are Baby Beluga, Bananaphone, All I Really Need, and Down by the Bay. Most of Raffi's children's albums include small, simple, folk instrumentations featuring Raffi's vocal and guitar work. Early works included contributions from Toronto-area folk musicians, including Ken Whiteley, The Honolulu Heartbreakers, and Bruce Cockburn. Raffi also incorporated many world music sounds into his records, including "Sambalele" (More Singable Songs, 1977) and "Anansi" (The Corner Grocery Store, 1979). Raffi preferred to play in small intimate settings. In his autobiography he notes that he turned down a very lucrative offer to perform a concert at Madison Square Garden because he thought the venue was too large for him to connect to children. He also wrote that early in his career, he found it difficult to perform for kids under 3 years old because their short attention span was distracting to him and to the rest of the audience. This led to him taking a hiatus from children's performing in the mid 1980s. In 1989 His album Raffi and the Sunshine Band was listed on the RPM Top 100 Albums chart. Raffi is currently the president of Troubadour Music Inc., a triple-bottom-line company he founded to produce and promote his work. He released recording for a number of other artists, including Caitlin Hanford and Chris Whiteley. As of 2017, Raffi has continued to perform and appears occasionally across Canada and the United States. Raffi's recent musical work focuses on social and environmental causes and appeals to the generation who grew up with his children's music ("Beluga Grads") to effect change in the world. He also promotes those causes through his books, academic lectures and as a speaker. In 2007, Raffi wrote, recorded and produced the single "Cool It", a rockabilly "call to action" on global warming with Dr. David Suzuki in the chorus. "Cool It" was the theme song for Dr. Suzuki's recent Canadian tour to promote action on climate change. In February 2016, Raffi released the song "Wave of Democracy" in support of American Senator Bernie Sanders run to be the nominee of the Democratic Party (United States) and the US Presidency. In the 21st century, Raffi has devoted himself to "Child Honouring," his vision for creating a humane and sustainable world by addressing the universal needs of children. The Child Honouring ethic is described as a "vision, an organizing principle, and a way of life—a revolution in values that calls for a profound redesign of every sphere of society." His "Covenant for Honouring Children" outlines the principles of this philosophy. In 2006, with Dr. Sharna Olfman, he co-edited an anthology, Child Honouring: How to Turn This World Around, which introduces Child Honouring as a philosophy for restoring communities and ecosystems. It contains chapters by Penelope Leach, Fritjof Capra, David Korten, Riane Eisler, Mary Gordon, Graça Machel, Joel Bakan, Matthew Fox, Barbara Kingsolver, Jean-Daniel Williams, and others. The book's foreword is by the 14th Dalai Lama. The musical album Resisto Dancing: Songs of Compassionate Revolution was released as a tie-in for the book. In a 2006 speech, Iona Campagnolo, Lieutenant Governor of British Columbia, referred to Child Honouring as a "vast change in the human paradigm." Raffi advocates for a child's right to live free of commercial exploitation and he has consistently refused all commercial endorsement offers. Raffi's company has never directly advertised nor marketed to children. In 2005, he sent an open letter to Ted Rogers of Rogers Wireless, urging them to stop marketing cell phones to children. He also turned down a film proposal for "Baby Beluga" because of the nature of the funding, which was based on exploitative advertising and marketing. Raffi has been hailed for his work as "Canada's all time children's champion." In October 2006, Raffi was presented with the Fred Rogers Integrity Award by the Campaign for a Commercial-Free Childhood at the Judge Baker Children's Center in Boston, for his consistent refusal to use his music in endorsements that market products directly to children. In 2012, after learning details surrounding the online bullying, exploitation and ultimate suicide of teenager Amanda Todd, Raffi and his Centre for Child Honouring co-founded the Red Hood Project with business owner, former Crown prosecutor, community and arts philanthropist and advocate Sandy Garossino and design professional, writer, educator and community activist Mark Busse. Red Hood Project is a movement for consumer protection for children online that launched in November 2012. In June 2013, Raffi published the book, Lightweb Darkweb: Three Reasons to Reform Social Media Before it Re-forms Us, which examines both the benefits and the dangers present on the internet and in social media. Special Achievement Award at the SOCAN Awards in Toronto in 2000. ^ Pogrebin, Robin, "The New York Times", "Not All Sunshine for Teensy Set's Troubadour". September 18, 2002. Retrieved on 31 October 2015. ^ David Farrell (19 December 1981). Cavoukian builds on small stable of acts. Billboard. Nielsen Business Media, Inc. pp. 71–. ISSN 0006-2510. ^ "A Covenant for Honoring Children" (PDF). Childhonoring.org. Retrieved 17 April 2014. ^ "Raffi Asks Rogers Not to Market Mobile Phones to Children – Commercial Alert". Commercialalert.org. 30 August 2005. Archived from the original on 14 February 2012. Retrieved 10 April 2012. ^ "Raffi on George Stroumboulopoulos Tonight: INTERVIEW". YouTube. 14 December 2012. Retrieved 30 December 2012. ^ "The Governor General of Canada > Find a Recipient". Gg.ca. Retrieved 10 April 2012. 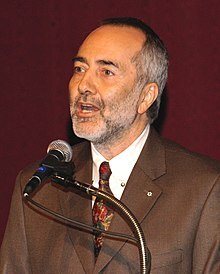 ^ "2001 Recipient: Raffi Cavoukian – Vancouver | Order of BC". Orderofbc.gov.bc.ca. 15 January 2009. Retrieved 10 April 2012. ^ "University of Victoria, Victoria, British Columbia, Canada, Media releases". Communications.uvic.ca. 13 October 2004. Retrieved 10 April 2012. ^ "CCFC – The Fred Rogers Integrity Award". Commercialfreechildhood.org. 2 February 2005. Retrieved 10 April 2012. Campagnola, Iona. "Campagnola says Child Honouring is a vast change in the human paradigm", "Child Honoring Luncheon" 2006-07-29. Retrieved on 14 March 2007. Cavoukian, Raffi. "Raffi's open letter to Ted Rogers asking not to market mobile phones to children", "Commercial Alert", 2005-08-30. Retrieved on 14 March 2007. Leiby, Richard, The Washington Post, "Raffi's Growing Pains", 31 May 1992. This page was last edited on 26 February 2019, at 19:57 (UTC).